Cryptantha dumetorum (Greene ex A. Gray) Greene. Habit: Annual 10--60 cm, prostrate to ascending, sprawling. Stem: branches throughout, prostrate to ascending, +- brittle; strigose to appressed-stiff-hairy. Leaf: 0.5--3(4) cm, linear to lanceolate, +- succulent; sparse-strigose and rough-hairy, hairs ascending to +- appressed, bulbous-based. Inflorescence: in 1s or 2s, +- sparse, flowers not 2-rowed, axis +- flat; bracts generally 0 or occasionally 1--2 near base; pedicels +- 0. Flower: calyx 1--1.5 mm, 2--3 mm in fruit, persistent; lobes dissimilar, 2 +- partly fused, strigose, 3 free, lanceolate with thickened midvein, sparse-strigose and long-spreading-bristly; corolla deciduous, limb 0.5--1 mm diam, appendages 0. Fruit: nutlets 4, 1.5--2.5 mm (1 > others), larger 1 wide-lanceolate, +- rough, persistent, smaller 3 +- lanceolate, deciduous, generally white-sharp-grainy, dull; abaxially rounded, ridge 0, adaxially +- rounded, attachment scar edges not raised, +- wide-gapped entire length, not flared or forked at base; axis generally to nutlet tips. Ecology: Sandy soils, dunes, slopes, or occasionally gravelly washes, generally under/on other plants; Elevation: 250--1400 m. Bioregional Distribution: SNH (e slope), e Teh, TR (n slope), s SNE, DMoj, n DSon; Distribution Outside California: southern Nevada, southwestern Utah. Flowering Time: Mar--May Note: Generally present in wet years. 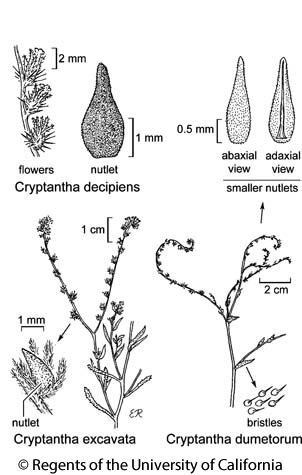 Citation for this treatment: Ronald B. Kelley, Michael G. Simpson & Kristen E. Hasenstab-Lehman 2012, Cryptantha dumetorum, in Jepson Flora Project (eds.) Jepson eFlora, http://ucjeps.berkeley.edu/eflora/eflora_display.php?tid=21222, accessed on April 23, 2019. SNH (e slope), e Teh, TR (n slope), s SNE, DMoj, n DSon; Markers link to CCH specimen records. Yellow markers indicate records that may provide evidence for eFlora range revision or may have georeferencing or identification issues. Purple markers indicate specimens collected from a garden, greenhouse, or other non-wild location.